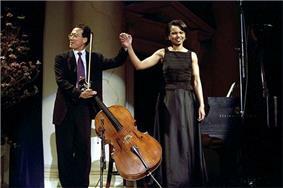 Yo-Yo Ma (born October 7, 1955) is a French-born Chinese American cellist. Born in Paris, he spent his schooling years in New York City and was a child prodigy, performing from the age of five. He graduated from the Juilliard School and Harvard University and has enjoyed a prolific career as both a soloist performing with orchestras around the world and a recording artist. His 90+ albums have received 18 Grammy Awards. In addition to recordings of the standard classical repertoire, he has recorded a wide variety of folk music such as American bluegrass music, traditional Chinese melodies, the tangos of Argentinian composer Ástor Piazzolla, and Brazilian music. He also collaborated with Grammy Award-winning jazz/reggae singer Bobby McFerrin. During the Dixie Chicks' controversial tour of 2005-6, Ma backed them playing cello as sideman, assisting in the string arrangements for the band. 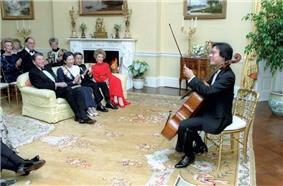 Ma's primary performance instrument is a Montagnana cello built in 1733 valued at US$2.5 million. He was awarded the National Medal of Arts in 2001, Presidential Medal of Freedom in 2011, and the Polar Music Prize in 2012. 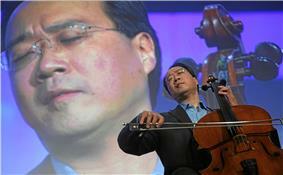 Yo-Yo Ma was born in Paris on October 7, 1955, to Chinese parents and had a musical upbringing. His mother, Marina Lu, was a singer and his father, Hiao-Tsiun Ma, was a violinist and professor of music at Nanjing National Central University (predecessor of the present-day Nanjing University). The family moved to New York when he was five years old. At a young age, Ma began studying violin and later viola, finally settling on the cello in 1960 at age four. According to Ma, his first choice was the double bass due to its large size, but he compromised and took up cello instead. The child prodigy began performing before audiences at age five and performed for Presidents Dwight D. Eisenhower and John F. Kennedy when he was seven. At age eight, he appeared on American television with his sister, Yeou-Cheng Ma, in a concert conducted by Leonard Bernstein. In 1964, Isaac Stern introduced them on the Tonight Show with Johnny Carson and they performed the Sonata of Sammartini. He attended Trinity School in New York but transferred to the Professional Children's School, from which he graduated at age 15. He appeared as a soloist with the Harvard Radcliffe Orchestra in a performance of the Tchaikovsky Rococo Variations. Ma studied at The Juilliard School at age 19 with Leonard Rose and attended Columbia University but dropped out. He enrolled at Harvard College later on. Prior to entering Harvard, Ma played in the Marlboro Festival Orchestra under the direction of nonagenarian cellist and conductor Pablo Casals. Ma would ultimately spend four summers at the Marlboro Music Festival after meeting and falling in love with Mount Holyoke College sophomore and festival administrator Jill Hornor his first summer there in 1972. However, even before that time, Ma had steadily gained fame and had performed with many of the world's major orchestras. His recordings and performances of Johann Sebastian Bach's Cello Suites recorded in 1983 and again in 1994–1997 are particularly acclaimed. He has also played chamber music, often with the pianist Emanuel Ax, with whom he has a close friendship back from their days together at the Juilliard School of Music in New York. Ma received his bachelor's degree from Harvard in 1976. In 1991, he received an honorary doctorate from Harvard. In 1997, he was featured on John Williams' soundtrack to the Hollywood film Seven Years in Tibet. In 2000, he was heard on the soundtrack of Crouching Tiger, Hidden Dragon and, in 2003, on that of Master and Commander: The Far Side of the World. He collaborated with Williams again on the original score for the 2005 film Memoirs of a Geisha. Ma has also worked with Italian composer Ennio Morricone and has recorded Morricone's compositions of the Dollars Trilogy including The Good, the Bad and the Ugly, Once Upon a Time in America, The Mission, and The Untouchables. He also has over 90 albums, 18 of which are Grammy Award winners. Ma is a recipient of the International Center in New York's Award of Excellence. On November 3, 2009, President Obama appointed Ma to serve on the President's Committee on the Arts and Humanities. His music was featured in the 2010 documentary Jews and Baseball: An American Love Story, narrated by Academy Award winner Dustin Hoffman. In 2010, Ma was named Judson and Joyce Green Creative Consultant of the Chicago Symphony Orchestra. In partnership with the orchestra's music director, Riccardo Muti, he launched the Citizen Musician initiative. Ma currently plays with his own Silk Road Ensemble, which has the goal of bringing together musicians from diverse countries all of which are historically linked via the Silk Road. He records on the Sony Classical label. He also founded the Silk Road Connect, which involved children from middle schools such as JHS 185 in Queens, New York. Ma's primary performance instrument is the cello nicknamed "Petunia", built by Domenico Montagnana in 1733. It was named this by a female student who approached him after one of his classes in Salt Lake City asking if he had a nickname for his cello. He said, "No, but if I play for you, will you name it?" She chose Petunia and it stuck. This cello, more than 280 years old and valued at US$2.5 million, was lost in the fall of 1999 when Ma accidentally left the instrument in a taxicab in New York City. It was later recovered undamaged. Another of Ma's cellos, the Davidov Stradivarius, was previously owned by Jacqueline du Pré, who passed it to him upon her death. 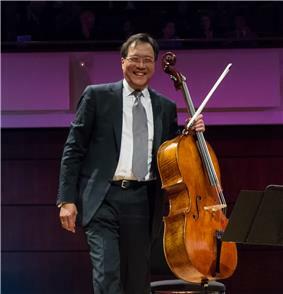 Though Du Pré previously voiced her frustration with the "unpredictability" of this cello, Yo-Yo Ma attributed the comment to du Pré's impassioned style of playing, adding that the Stradivarius cello must be "coaxed" by the player. It was until recently set up in a Baroque manner, since Ma exclusively played Baroque music on it. He also owns a modern cello made by Peter and Wendela Moes of Peissenberg, Germany, and one of carbon fiber by the Luis and Clark company of Boston. Ma performed a duet with Condoleezza Rice at the presentation of the 2001 National Medal of Arts and National Humanities Medal Awards. Ma was the first performer on September 11, 2002, at the site of the World Trade Center, while the first of the names of the dead were read in remembrance on the first anniversary of the attack on the WTC. He played the Sarabande from Bach's Suite in C minor (#5). He performed a special arrangement of Sting's "Fragile" with Sting and the Mormon Tabernacle Choir during the opening ceremonies of the 2002 Winter Olympics in Salt Lake City, Utah. He has also appeared as a Pennington Great Performers series artist with the Baton Rouge Symphony Orchestra in 2005. On October 27, 2008, Ma appeared as a guest and performer on The Colbert Report. He was also one of the show's guests on November 1, 2011, where he performed songs from The Goat Rodeo Sessions with fellow musicians Stuart Duncan, Edgar Meyer, and Chris Thile. On October 5, 2015, he appeared on Colbert's new show The Late Show with Stephen Colbert in support of ballerina Misty Copeland and prematurely celebrating his 60th birthday. Ma is married to Jill Hornor, a German literature professor at Harvard. They have two children, Nicholas and Emily. Ma's albums include recordings of cello concertos (including, among others, Shostakovich, Brahms, Elgar, and Haydn), sonatas for cello and piano, Bach's cello suites, and a variety of chamber music. He has also recorded in non-classical styles, notably in collaboration with Bobby McFerrin on their 1992 Sony album, Hush. ^ a b National Medal of Arts, National Endowment for the Arts. ^ Presidential Medal of Freedom. Presidential Medal of Freedom. ^ : "Jackie’s unbridled dark qualities went against the Davydov. You have to coax the instrument. The more you attack it, the less it returns." ^ Kennedy Funeral Includes Family, Music, President. Thebostonchannel.com (August 28, 2009). Retrieved on July 1, 2011. ^ whitehouse.gov. whitehouse.gov. Retrieved on July 1, 2011.